Many new cars on the road today are loaded with advanced safety systems that can “see” what’s around you, exposing blind spots and nearby hazards. Featuring radar and vision processing technology, these cars automatically steer and brake you to safety if you’re slow or unable to react. But what if you could “see” even further than what’s nearby, around curves, around other vehicles, through the dense urban environment, and even up to a mile away? With V2X (vehicle-to-everything) communications, cars can “talk” to other cars, motorcycles, emergency vehicles, traffic lights, digital road signs, and pedestrians, even if they are not directly within the car’s direct line-of-sight. 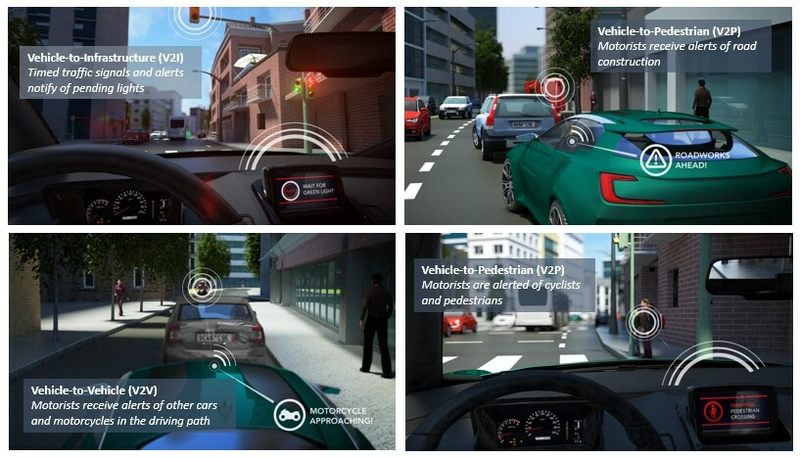 With V2X, your car is alerted of roadway hazards that are impossible to see in advance. With V2X, your car is alerted to what’s hidden from sight far ahead, around corners and over hills, detecting and warning you in real-time of other vehicles, road works, traffic congestion and even people – long before radar sensors or vision systems would have detected the hazards. Have you ever driven on a fast-moving curve on a highway, and suddenly found yourself slamming the brakes to avoid crashing into a glowing sea of red lights? With V2X, you and your car would have been automatically warned of the traffic pile up, offering you safety-critical beyond-line-of-sight data that no other sensor can detect. A V2X-enabled car can automatically broadcast that its emergency brakes are in use, setting in motion a warning to other cars in the area to slow down. V2X also makes intersections safer, smoother, and improves traffic flow. Cars approaching traffic lights receive real-time warnings to slow or speed up prior to arriving at the intersection. In fact, as cars move towards complete autonomy, knowing how much time remains before the traffic light turns red is essential information to guarantee a smooth autonomous driving experience. V2X alerts can even pinpoint road construction blocks away, see approaching motorcyclists or other vulnerable road users, and help smooth the way for approaching emergency vehicles through traffic or complex rural conditions. As two or more things enabled with V2X come into range, they form an ad-hoc wireless network based on the DSRC (dedicated short-range communications) 802.11p standard. 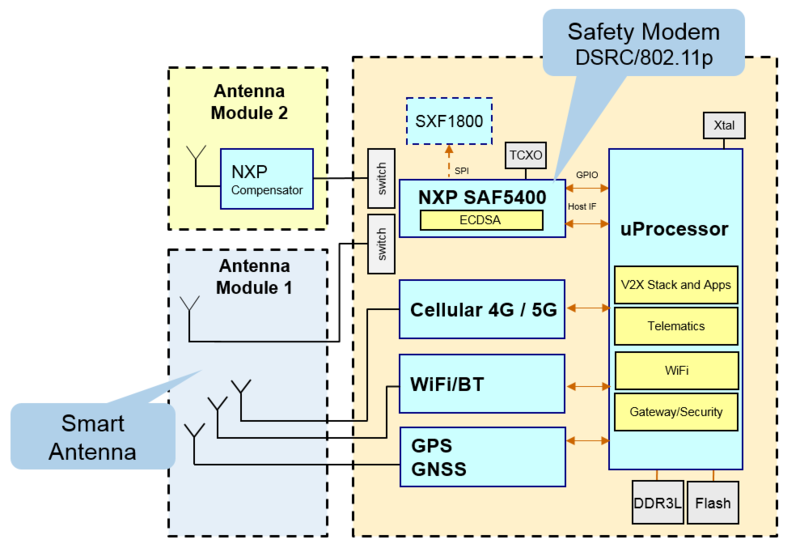 Unlike cellular based V2X which requires the assistance of a network, the DSRC communications allow them to automatically transmit and send real-time short, dedicated safety-critical messages to each other. The key is “real-time” messaging. Recently, we announced the industry’s first scalable, single-chip V2X platform that can verify more than 2,000 messages per second on chip. And it operates over a distance up to a mile, even in areas where cellular network connections are not available. The technology has been proven to be fast enough to enable fully autonomous truck or car platoons separated by less than 0.5 seconds. It has been recently demonstrated by the EU platooning initiative. As with any connected device, there’s a risk for potential attack by hackers. Connected cars are no different. That’s why we offer the industry’s highest security level available in a “security by design” approach to car OEMs. Our secure V2X RoadLINK® platform features our secure element technology. It’s the same technology that’s used in the world’s most sensitive security environments around the world, from electronic passports, banking cards, smartphones. Secure element technology demonstrates ultra-high resistance to physical probing and tampering, and is a natural fit into the connected car. Each region comes with its own slightly different flavor of V2X applications, requiring global OEMs to develop software to support each market roll out. This is where our software-defined radio technology comes in handy. To give carmakers a versatile edge on manufacturing, carmakers can use the same V2X platform across all of their makes and models worldwide, supporting multiple global regions. Customization for regional V2X standards is done at the software level. Viola – one world, one platform! Finally, it is well known in the industry that there are multiple standards all competing for a slice of the worldwide V2X market. Not only DSRC / 802.11p, but also Cellular-V2X (4G, 5G) and even standard WiFi have all made attempts to grab mindshare and headlines into this expanding market. Who will win? At NXP, we believe that applications ultimately match up to the appropriate technology, and in this space we see that all connectivity technologies have a place. We see DSRC wins in safety real-time critical applications like emergency systems, platooning, autonomous driving, whereas cellular-V2X wins in applications needing a very fast data pipe for “vehicle to network” and other related services or applications. Plus, DSRC is available now in cars on the road in Japan and US, and is coming to Europe as early as 2018. 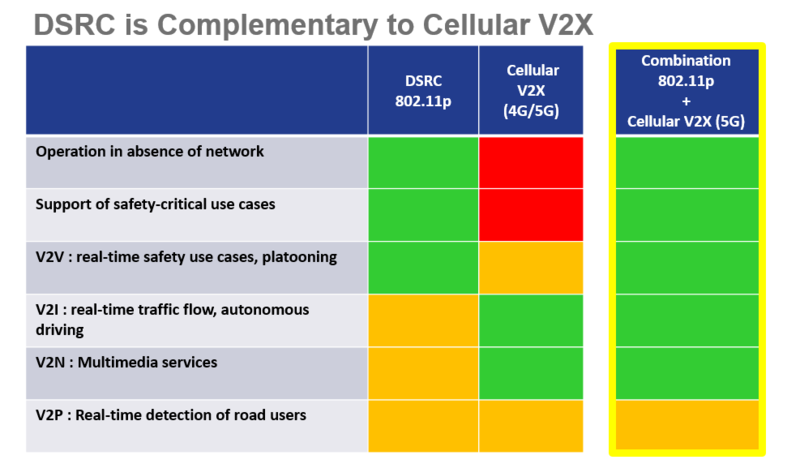 The Cellular-V2X technology is still not yet here (it is still in the standardization process), however, if or when it arrives, it will work best in areas with cellular coverage, which can complement the direct car-to-car connections offered by DSRC, assuming the cellular network is available. V2X is already rolled out in cars in the US and Japan, and we’ll see even more on the road soon. In the U.S., safety was the key motivator for the United States Department of Transport’s (USDOT) recent proposed rule to mandate that automakers include Vehicle-to-Vehicle (V2V) technology in all new light-duty vehicles. Many cities around the world are deploying road side units using the 802.11p/DSRC standard. NXP is recognized as a world leader in V2X technology, and we are proud to be launching our next generation product, the world’s first scalable, single-chip secure V2X modem. 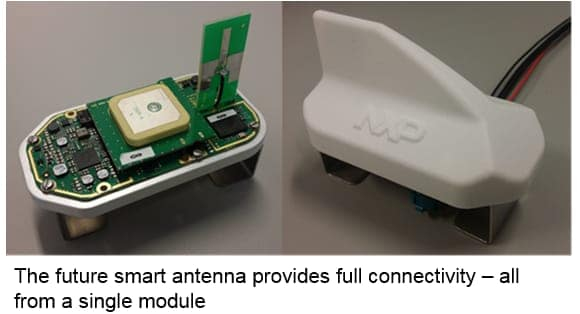 As we look to the future, we envision scalable, smart telematics control units (TCUs) inside the car, being built as hybrid “smart antenna” architectures enabling wireless connectivity to pass in and out of the connected car. Get ready for a fast ramp up with more excitement to come as we drive further down the road to fully connected cars!